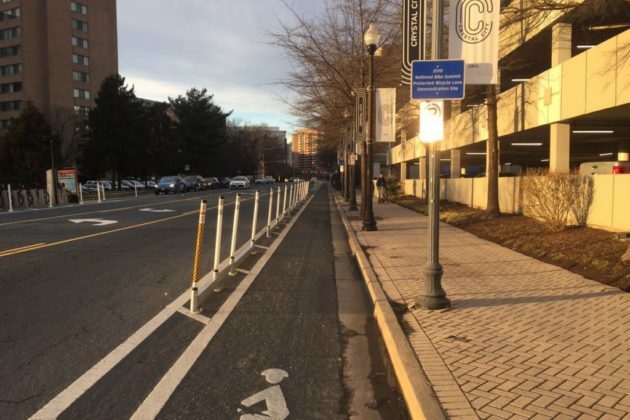 Bicyclists in Potomac Yard and Crystal City might’ve noticed some funky new protected bike lanes around town — but some of them won’t be sticking around for long. 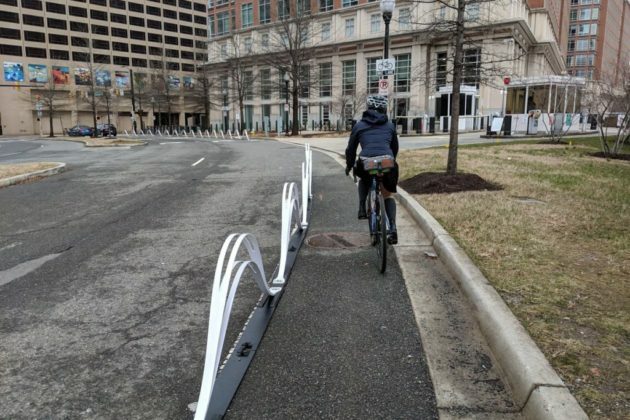 The lanes popped up this week to coincide with the “National Bike Summit,” a gathering of cycling activists held at the Hyatt Regency Crystal City. Some of the protected lanes are located along S. Eads Street in Crystal City, near the road’s intersection with 22nd Street S. They’re part of the “BikeRail” product backed by Minneapolis-based firm Dero, and are a bit sturdier than the plastic poles the county has installed along other protected bike lanes. The Crystal City Business Improvement District says Dero donated the BikeRails for pilot program purposes, and county staff installed them this week. They may not stay in their current locations, but the county plans to keep them a little longer, at least. 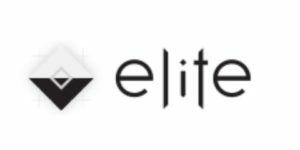 Another bike company sponsoring the conference, Bike Fixation, donated some even more unusual looking lanes for cyclists to try out. 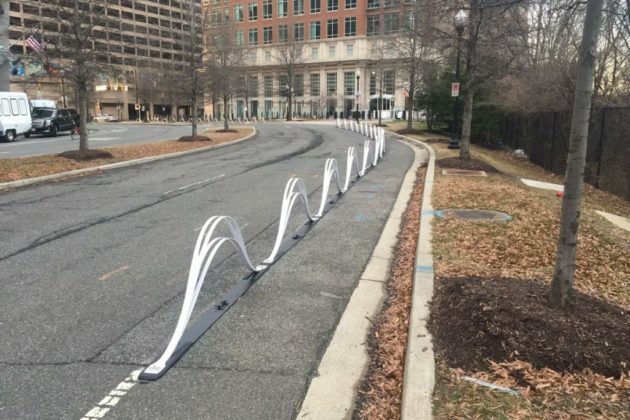 The county set up the wave-shaped barriers along a stretch of S. Potomac Avenue in Potomac Yard, leading up to where the bike conference was held. Those, however, are merely temporary, according to the League of American Bicyclists (which sponsored the conference). They could be gone as soon as sometime this week.